With more than a decade of experience in the books, Trifecta Roofing and Construction is your source for professional contractor and roofing services in McKinney and throughout North Texas. Our team of friendly roofers and builders offer a wide range of services to help you keep your home in tip-top shape. We feature Malarkey Roofing Products and can conduct roof installations, re-roofs and roof repairs for all roofing types, including flat roofs, shingle roofing, tile roofing and metal roofing. We can also assist with gutter installation, garage doors, tile work, fencing and much more. Whether your has has suffered a roof leak or if it is time for a roof replacement, We can help! We're your professional roofing contractor in McKinney, Allen, Fairview and the surrounding communities. 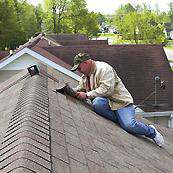 Call Trifecta Roofing to schedule a free roof analysis and a no obligation estimate for any roofing services. Over the years we have served thousands of satisfied customers. We strive to be upfront aboutthe work we do because your complete satisfaction is of major concern to our team. Whether we're installing a new garage door or completing the roofing on a new home, you'll love our services from start to finish. We take a consultation style approach to every job, meaning you'll be completely aware of everything that is happening and why, while we work on your home. Once we're done we conduct a thorough clean up, ensuring no debris, tools or materials are left behind. With offices in McKinney and Wichita Falls we make roofing in North Texas convenient! We use the finest roofing materials available for every job we do and most services are available with an in depth warranty. To learn more about all that we do or to schedule your free consultation for roof repair, roof maintenance or roof installation in McKinney or the surrounding area don't hesitate to call Trifecta Roofing and Construction at (469) 620-7672. When you work with Trifecta you can Bet on Perfection.